Throughout the years, it has been fascinating to study the migration habits of the American population. Even though there has been a long decline in the percentage of U.S. residents who move each year, as found by the U.S. Census Bureau, some states are still seeing a heavy or moderate inbound of residents. And, lucky for us, Texas, and the South, happens to be one of those regions seeing a moderate to heavy influx of residents. 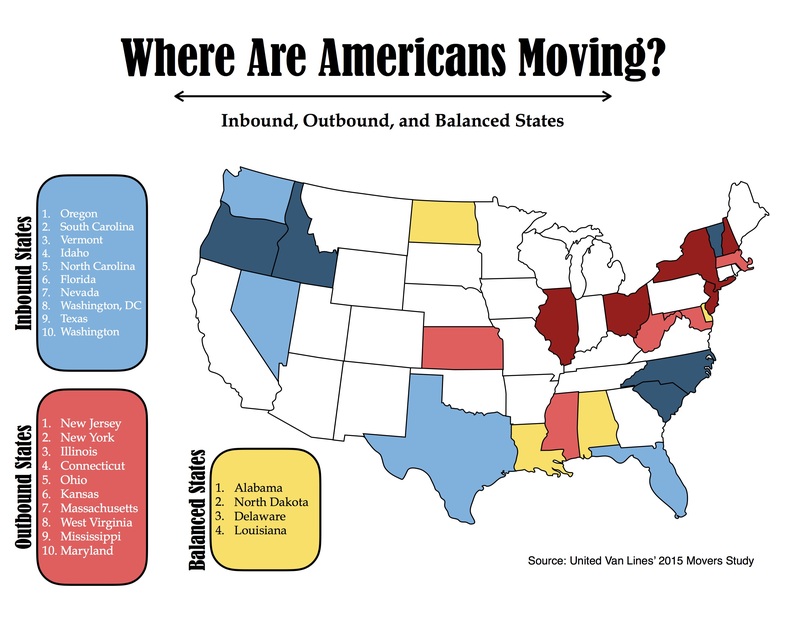 According to the United Van Lines’ 2015 Movers Study, 2015 saw an inbound of residents to the South and Northwest and a high outbound of residents from the Northeast. Americans are moving where it is warmer. It’s no secret that the South is warmer than the North. With that in mind, the influx of residents to the South could be due to the Baby Boomer generation reaching the age of retirement and wanting to move somewhere warmer (i.e. no snow, and easier to get around). Americans are moving where there is more job opportunity. According to Zippia, Texas is the No. 1 best state in America to get a job. These rankings were determined by: unemployment rate, recent job growth, future job growth, state income tax and median household income adjustment for the cost of living. In addition, Texas was ranked No. 5 best state to make a living. While the study found that the median wage in Texas is less than the average, it also found that there is a lower cost of living in Texas compared to other states in the U.S.
Americans are moving to locations where real estate is less expensive. What states are the most affordable in the United States? According to Movoto, Texas tied as the fourth most affordable state in the U.S. Other southern states that made the list include: Oklahoma (No. 2), Arkansas (No.8), and Louisiana (No. 10). Based on the information above it appears that Texas, and the South, are seeing and will continue to see an influx of residents. The cost of living is good, the weather is warmer, and it looks like there is plenty of job opportunity! Are you or someone you know interested in moving to our area? I am always here to help!